H2 Designs: Inkspirations Christmas Blog Hop! 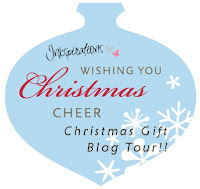 Welcome to Inkspirations Christmas Blog Hop. You may have arrived from the amazingly talented CARRIE'S site, but if not, just follow your way around the loop to see all the amazing projects. Enjoy the Inkspiration! This final idea popped into my head when I was making the placecards - a Christmas pudding easel card, with a silver spoon resting on the plate to hold the pudding section of the cards upright..... Hmmm?! Next stop to visit is the exceptionally clever ILINA!